At ONE Community, we are committed to reshaping Arizona’s image through educating, empowering and connecting our diverse LGBTQ and allied communities on the benefits of inclusion and its direct impact on attracting and retaining top talent and businesses to ensure our state’s economic sustainability. When my wife and I started ONE Community, we took a huge risk. We bet our life’s savings that if we created a community of LGBTQ and allied, businesses and individuals that supported one another, we would create a stronger fabric – and that together – we would make a difference. Unfortunately for us, the day after we launched our first website the stock market dropped 800 points. But despite those brutal headwinds, we believed, and we knew that ONE Community was the right thing to do. So, we buckled down and we led with our hearts, we told our stories, we had lots and lots of cups of coffee with anyone who was brave enough to sit down with us. It was an incredibly vulnerable time for us, but we believed we could find opportunity in adversity, and we knew how important it was to be patient and persistent and to educate the business community to partner with us and that we would find the path forward together. We believed that our personal connections, our faith, our bonds of common humanity – the love we share for our friends, our chosen family – would give us the strength to be courageous and bold enough to commit to ideas that are bigger than we are. And so, in 2014 when Senate Bill 1062 came to our state’s Capitol, instead of turning inward, we did what we do best, we turned outward … we had tough conversations about the very real negative impacts SB 1062 would bring to our state, we brought diverse constituencies together – the business community, the faith community, the LGBTQ and allied community to voice opposition. 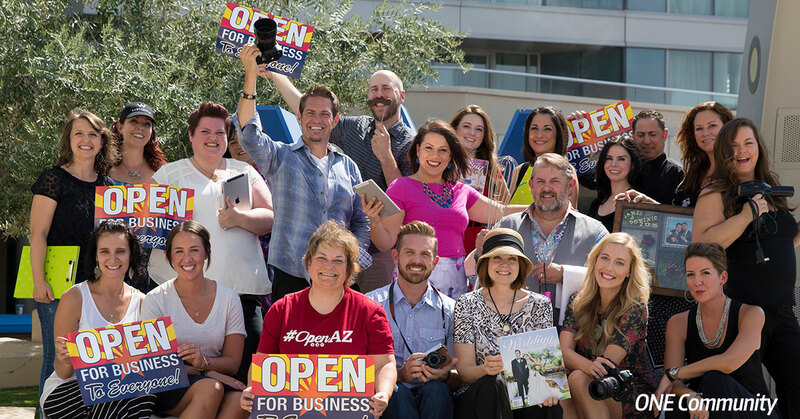 We created our “open for business to everyone signs” to empower everyday Arizonans. Shop owners, businesses and organizations of all sizes proudly displayed the signs and showed our nation that SB 1062 did not represent the Arizona we believed in. Because – it is always the right time to do the right thing. We – all of us, together – we were successful. The governor vetoed SB 1062, and ONE Community has never looked back. We continue to advocate every day for equal treatment for all people. And our UNITY Pledge – a public declaration to treat LGBTQ people fairly in employment, housing and public accommodations is now the largest equality pledge in our great nation. We continue our work through our business inclusion summits, our faith outreach efforts, transgender awareness programs and so much more. Our work is not always easy, but as we like to say – it’s always the right time to do the right thing.